Citation Information: J Clin Invest. 2007;117(12):3922-3929. https://doi.org/10.1172/JCI32163. Immune-mediated antitumor responses occur in patients with metastatic melanoma (MM), and therapies designed to augment such responses are clinically beneficial. Despite the immunogenicity of melanoma, immunomodulatory therapies fail in the majority of patients with MM. An inability of DCs to sufficiently activate effector cells may, in part, underlie this failure of the antitumor response seen in most patients. In this work, we show that mutation of N-RAS or B-RAF, signature genetic lesions present in most MMs, potently induced the expression of cell-surface CD200, a repressor of DC function. Employing 2 independent, genome-wide microarray analyses, we identified CD200 as a highly dynamic, downstream target of RAS/RAF/MEK/ERK activation in melanoma. CD200 protein was similarly overexpressed in human melanoma cell lines and primary tumors. CD200 mRNA expression correlated with progression and was higher in melanoma than in other solid tumors or acute leukemia. Melanoma cell lines expressing endogenous CD200 repressed primary T cell activation by DCs, while knockdown of CD200 by shRNA abrogated this immunosuppressive effect. 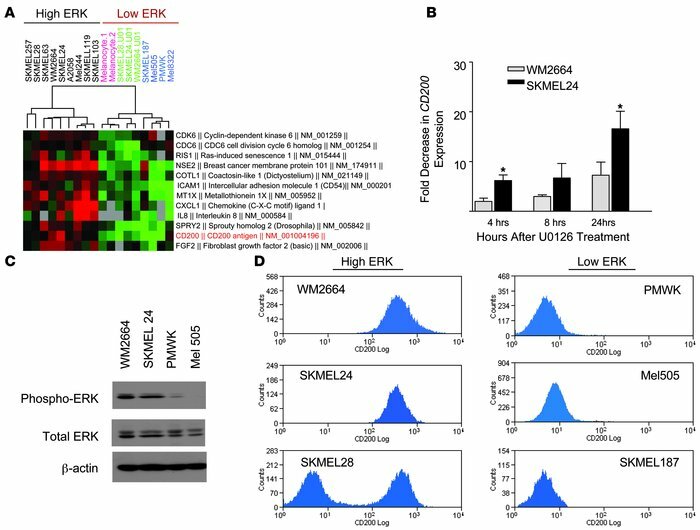 These data indicate that in addition to its effects on growth, survival, and motility, ERK activation in MM attenuates a host antitumor immune response, implicating CD200 and its interaction with the CD200 receptor as a potential therapeutic target for MM. CD200 is a p-ERK target in melanoma. (A) Dendrogram of melanoma-specific transcripts that are regulated by p-ERK expression in indicated melanoma cell lines. Melanoma cell lines with high levels of activated ERK (black) show increased CD200 expression. Melanoma cell lines with low ERK activity lacking RAS/RAF mutation (blue) or treated with UO126 (a MEK inhibitor; green) and normal human melanocytes (red) have low expression of CD200 and other known ERK targets. (B) TaqMan qRT-PCR of CD200 expression after U0126 treatment of human melanoma cell lines. WM2664 and SKMEL24 cell lines were treated with U0126 for 4, 8, and 24 hours. CD200 expression was normalized to a control transcript (18S). Error bars are ± SEM. *P < 0.05. (C) Immunoblot showing ERK activation in melanoma cell lines. Protein lysates from the indicated melanoma cell lines were immunoblotted with anti–p-ERK and anti–total ERK. (D) Flow cytometry was performed on melanoma cell lines WM2664, SKMEL24, and SKMEL28 (high p-ERK) and melanoma cell lines PMWK, Mel505, and SKMEL187 (low p-ERK). The high p-ERK lines express high levels of CD200, while low p-ERK lines express low levels of CD200.